Little Legends offers the Header Soccer Jersey for sale. 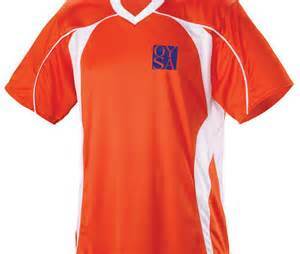 This Moisture Wicking Flat-Knit Polyester jersey features Rounded notch collar and Contrast color B-edge and inserts. The jersey is available in Colors: Royal/White, Red/White, Black/White, White/Black, Gold/White, Navy/White, Orange/White, Maroon/White, Purple/White, Dark Green/White, Fuschia/White, Columbia White. It is available in sizes: YS,YM,YL, AS,AM,AL and AXL. We can personalize them for you at an additional cost. See options below for personalization.